Bergie is Ellies daughter out of Teri Knox’s Ranger. Bergie is a gorgeous tri color with a shiny black slightly wavy coat. She is always the happy and the very affectionate one, also a lap dog. She is also bossy, and vocal about things and we call her the little instigator! 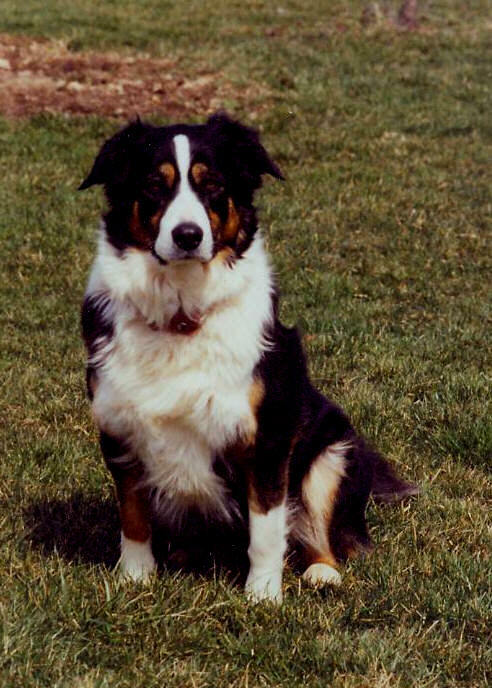 She loves to play ball and Frisbee and shows much herding instinct and needs something to herd. We are looking into that! Bergie spends her days watching over the horses. She loves a ball game with even the youngest of children who visit and is always very gentle with them, Bergie is quite biddable, always the one to come running first when I call. She knows our names, all her dog buddies names and the horses names! When she and her sister Breezie go out in the morning and I say “go see the horses” they race each other to the pasture. Their speed always amazes me. Bergie is showing an big interest in fishing lately especially with the kids who come out to fish.